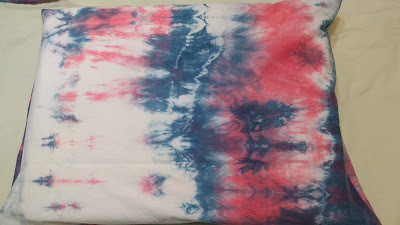 The hand dyed fabric for the pillowcases just kept calling my name. I could not resist. The pillows on my bed are not standard pillows. So I had to adapt the pattern to make it work. 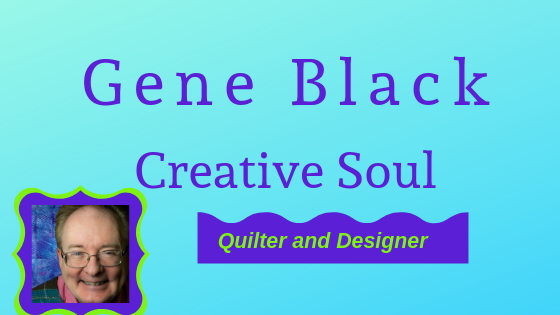 However, you can find the pattern that I worked from on Wanda Hansen's website in the "Free Resources" area. When I started laying out the plan, I realized that the pillowcases would have to be pieced. So I made a front and a back piece for each of them. One of the pieces has a flap/pocket that the end of the pillow goes in so that the pillow doesn't come out of the end. I really like that feature as it keeps the end of the pillow cleaner. That flap is supposed to be the front but mine is the back so I made the front hem even with the edge. appreciate why I changed the position of the flap. While this side is pretty too, the other side has a nicer design symmetry. Then I made the other pillowcase and repeated the "mistake" for the sake of consistency. The second one is in the front here. 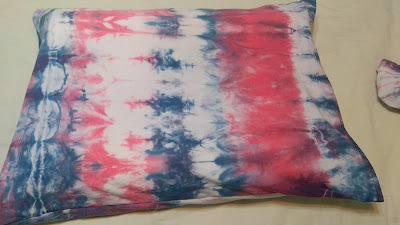 I love these new hand dyed pillowcases. There were some nice scrap pieces left over from the pillowcases. These will be so much fun for piecing or perhaps another project. Now I want some 100% white cotton sheets to dye too! FYI - my posts may be sparse for the next few weeks as there is a lot of "non-crafty" stuff going on in my life. But no worries - these are mostly good things. Comments are welcomed. I will reply when possible unless otherwise stated. 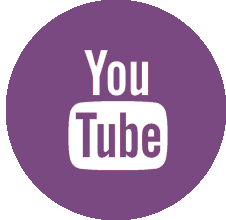 However at this time Blogger is not notifying me of comments. Of course if you are a "No Reply Blogger"- I can not reply. Links in comments will result in the entire comment being deleted. Lovely! A lot of tie dyers get their cotton sheets for dyeing from Goodwill. You don't have to start with a matching set to get a matching set in the end! I really like this style of pillowcase too. Yours are quite unique! I have a microfiber purchased pillowcase that has the pillow sliding out all the time. I may have to unstitch it and make it this style from the fabric. Sheets to match the pillow cases are a great idea. 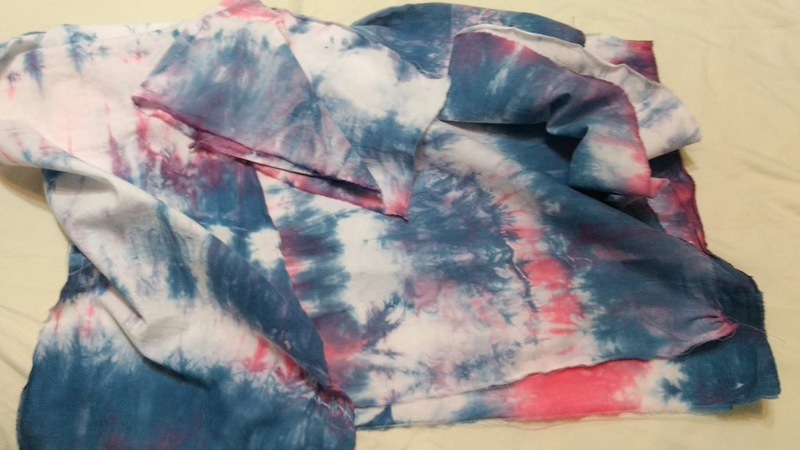 Great use of hand dyes! I never quite know how to use hand dyes in a quilt...I hate cutting them! 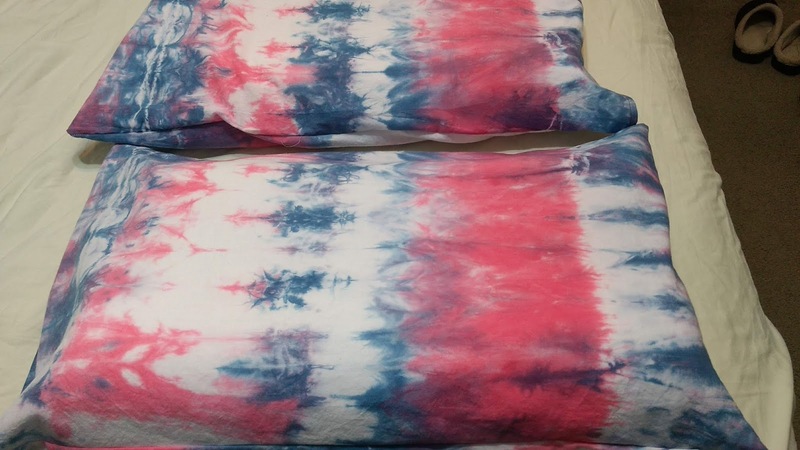 Your pillow cases turned out really nice. Are they square? I like that idea of a flap. I have a set of pillow cases with a flap but just never think to do that when making my pillow cases. Of course, you have to have matching sheets and maybe a quilt to complete the set since you have scraps! Your pillowcases look great Gene. Are the pillows those contour ones meant for supporting your neck properly? That's the type of pillow I use and I absolutely cannot buy pillowcases for them. I've made a couple but messed up the flap -- in different ways -- on both of them. Still useable but not as pretty as they should have been.